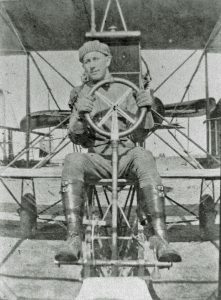 On March 13th, Pascale Guindon, a Parks Canada historian, will tell us the remarkable story of Lieutenant William Sharpe of Prescott, and his career as an aviator during the First World War. The talk looks at his early life and training, Canada’s first attempt at an aviation corps, his overseas service and concludes with some thoughts on his aviation legacy. From 2014 until 2018, Canada is commemorating the centennial of the First World War, a global event that left lasting effects on generations of Canadians. During this commemorative period, Parks Canada has been recognizing and honouring the memory of Hometown Heroes across the country who contributed each in their own way to the war effort. Lt. Sharpe is one such hero. Pascale Guindon is an historian with Parks Canada. With a passion for history since childhood, she studied in architectural history and Canadian Studies and began her career in heritage conservation as a student interpreter at Fort Wellington National Historic Site in Prescott. She is currently in the role of National Programs Coordinator for Parks Canada’s National Celebrations Branch helping to commemorate and celebrate with Canadians significant anniversaries of people, places and events that have helped shape the Canada of today. Please join us at the Brockville Museum at 7:30 pm to hear this presentation and learn more about genealogy in Leeds & Grenville. Refreshments and an opportunity for discussion will follow the presentation. If you have any books hanging around your house that others might like to read, the Brockville Museum is accepting donations for its upcoming annual Book Sale. There will be a cart in the Museum lobby where you can drop off donations. This entry was posted in Meetings and tagged Family History, Genealogy, United Counties of Leeds & Grenville, WWI on March 13, 2017 by Charles Godwin - TSIC. Update: The speaker for the February 13th meeting of the Leeds & Grenville Branch of The Ontario Genealogical Society has had to cancel her appearance due to family illness. Instead, the meeting will feature a Show and Tell of genealogy stories. If you would like to tell us one of your stories, please come prepared to speak for about five minutes. If you have photos or books to illustrate your story, please bring them along. Refreshments will follow the presentations. The Leeds & Grenville Branch, OGS will meet on Monday February 13th in the Brockville Museum beginning at 7:30 p.m. 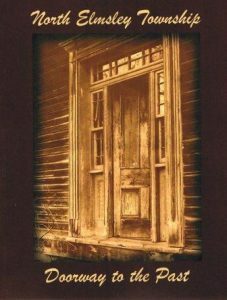 Guest speaker will be Shirley Jones-Wellman, co-author of the book North Elmsley Township Doorway to the Past. Shirley, a retired librarian, is one of four volunteers with a love of history who banded together to research and write a history of early Elmsley Township north of the Rideau. She will speak about the hardy settlers and their families who took up land and made it their home. Refreshments will follow, with a chance to speak with local genealogists about your research. This entry was posted in Meetings and tagged Family History, Genealogy, Lanark County, North Elmsley Township on February 8, 2017 by Charles Godwin - TSIC. Brent Collett, local land surveyor and mapper, has been invited to speak. His company was founded in 1881 by Willis Chipman. He has a library of old records from several Ontario land surveyors as well as surveying tools and documents over 150 years old. This entry was posted in Meetings and tagged Family History, Genealogy, Ontario Land Surveyors on October 21, 2016 by Charles Godwin - TSIC. Pepper Mintz, owner of Get it Done Photo Solutions, has been invited to present. Her company deals with photo organizing and management from the shot to the finished production of photo books, displays & gifts. This entry was posted in Meetings and tagged Family History, Genealogy, Photos on October 21, 2016 by Charles Godwin - TSIC. Kathleen Burtch will give a presentation on Grenadier Island. This is also our Pot Luck dinner at 6:30. Bring a dish to share, a plate and your cutlery. Drinks are provided. This entry was posted in Meetings and tagged Family History, Genealogy, Grenadier Island, United Counties of Leeds & Grenville on October 21, 2016 by Charles Godwin - TSIC. Summer vacations are over and fall is approaching. Also approaching is a return to the regular meetings of the Leeds & Grenville Branch of the Ontario Genealogical Society. The new season starts on Monday, September 12th at 7:30 p.m. in the Brockville Museum. Do come out and join us & bring a friend. This entry was posted in Meetings and tagged Family History, Genealogy, Lansdowne, United Counties of Leeds & Grenville on September 11, 2016 by Charles Godwin - TSIC. Many people have ancestors who served in the military and their service is unknown to their descendants. Learn some tips, tricks and sources to find those ancestors and discover what they did. Featured case studies are: an ancestor who fought in the Rebellion of 1837-1838; and some relatives who fought in the First World War. Terry Findley, BSc, MBA, a native of Ottawa, served in the Canadian military for over 36 years. A past BIFHSGO Director Programs & Conference, he has written and lectured extensively on basic and advanced genealogy research, photo restoration and tracing Irish roots. Currently he and his wife Tad publish a new magazine called Many Families. This entry was posted in Meetings and tagged Family History, Genealogy, Military History on April 24, 2016 by Charles Godwin - TSIC. We all have them, those road blocks that prevent us from finding out the answers to our family history research questions. Some of these brick walls are self-imposed due to assumptions we make and hold on to or our by our own preconceptions. Yet there are also those research brick walls not of our own creation. By using real-life examples we will look at various common brick walls and possible ways to work around them. Ken McKinlay‘s foray into his family tree research started with three simple family stories that he wanted to confirm or refute. He has now been researching his family tree for over 15 years making use of the Internet as his primary means of locating relevant documents and also discovering new cousins. He has given talks for the Ottawa branch of the Ontario Genealogical Society, BIFHSGO, and the Ottawa Public Library. His talks generally focus on methodologies and providing the skills needed to help solve those brick wall problems. This entry was posted in Meetings and tagged Brick Walls, Family History, Genealogy on April 13, 2016 by Charles Godwin - TSIC. 2016 is the 200th anniversary of the original trek of discharged soldiers and Scottish settlers to the Perth Settlement. These people walked from Brockville to Perth where the new settlement was founded. In May, 2016 this trek will be re-enacted and many of the participants will be descendants of the original settlers. Clark Theobald of the Rideau Lakes Historical Society will be our guest speaker and provide details of the Trek and subsequent settlement. The presentation will focus on identifying those settlers who headed north from Brockville in the Spring of 1816 as part of the first British government sponsored and administered settlement program in North America. Using original documents and modern technologies, we will follow their journey to Unionville, Athens, Delta and the Old Landing. The Settlers Trek 2016 program, presented by the Athens Lions Club, will be re-enacting the original Trek of the Scottish and disbanded soldier/settlers to the Perth Military Settlement in 1816. This unique 200th Anniversary project will be attempted from May 15-20, 2016 and pass through the communities of Brockville, Lyn, Athens, Delta, Portland, Rideau Ferry and Perth. At each locale, a welcoming ceremony and community celebration will take place. Participants will include walkers and horse and wagon teams, plus there will be a separate water route from Portland to Perth attempted by the Geo-Venture class from Perth and District Collegiate Institute. The 2016 Trek project was originally conceived by Clark Theobald out of discussions within the Perth 200th committee. Clark is a retired school teacher with a passion for local history. He will be accompanied by his wife, Elizabeth, also a retired school teacher, and Larry Cochran from Portland, a member of the Rideau Lakes Historical Society. Two special guests will include Kathy de Souza, a descendant of John Kilborn, and Ron Shaw, a Perth author with a very strong interest in the military history of this region. This entry was posted in Meetings and tagged Anniversaries, Family History, Genealogy, Lanark County, Perth Military Settlement, United Counties of Leeds & Grenville on March 29, 2016 by Charles Godwin - TSIC.